Basically a series of idiotic utterances from a rowdy, annoying yobbo who jumps the queue to get into a party and then spends the rest of the song shouting his lungs out over a stupidly simplistic piano loop. Bona fide classic. Then I was a big fan of house music, the stock market plate already knew me very well because of this, and drew on the walls yellow smile :-) ,one of the best recordings of the genre of house music. 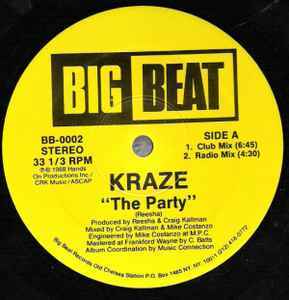 Although it only just dented the top 30 when initially released at the end of the second summer of love back in 1988, Kraze’s ‘The Party’ remains as a milestone in house music’s well documented history. Instantly familiar with echoes of vintage Todd Terry and Detroit techno, the chords and raucously shouted vocals ‘you want this party started right… somebody scream’ have been ever-present since its appearance. Fitting then that in the age of remixes this finally succumbs to the update. Subtle in the main (dated sounding in other words!) this one-sided promo copy is surely the first of several new versions, with the remix treading the Yoshitoshi-esque path - deep and hypnotic in parts, housey and pumping in others. Now somebody scream!!!! !